Maria's Mélange: Nerdbery Challenge - GO! Resolutions become much more real when you let people know about them, right? As I mentioned briefly in my last post, I’ve decided to take on a challenge with some of my Nerdy Book Club colleagues. The plan? To read all of the Newbery books starting in 1922. Now, the challenge is also meant to be “no stress” – meaning that we can each make the challenge fit our own needs and desires. My plan is to read at least one book from each year, and to complete the challenge within two years. If I’ve already read the Award book I’ll either reread it or choose one of the Honor books to read. For those who are handy with the math, that means 90 books. So I’m shooting for about 4 books a month to meet this challenge. That, of course, is in addition to the other books I already plan on reading. Oh, and all the comics I plan to read…. I suppose if I get behind I can always make it a 3 year goal, right? I’ll admit – it’s supposed to start tomorrow, but I’ve already begun. The Award book from 1922 is called The Story of Mankind. I’m about a third of the way through it right now. It reads almost like a textbook, which is an odd change from the more recent Newbery books I have read. I’ll keep the specifics to myself for now, in the hopes that this challenge will also help me post more frequently! Story of Mankind This is a link to the video one of the #nerdbery organizers (Mr. Schu) created about book number one. 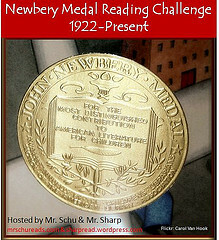 If you care to join me, check out the “official” site of the Nerdbery challenge. 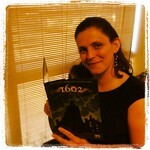 Also check us out on twitter with the hashtag #nerdbery. There is also a NerdCott challenge, but I’m going to focus on just the Nerdbery!